Hamas official accuses Israeli and American leaders of committing "crimes" against Palestinians that endanger world peace. 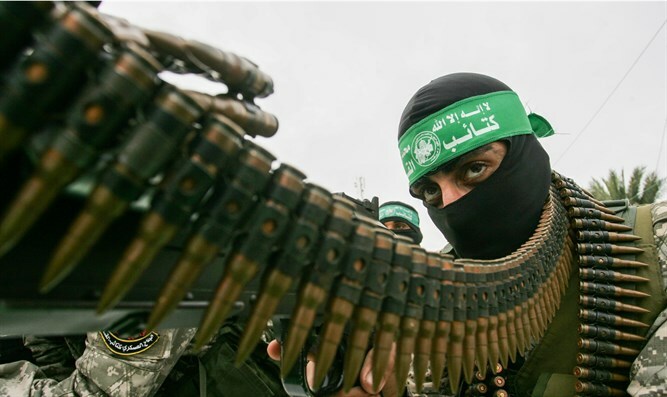 Hamas spokesman Fawzi Barhoum on Saturday accused Israel and the United States of "war crimes" in the wake of the Israeli military response to the so-called "March of the Return" and the U.S. backing of Israel in the international arena. "The blood of the nurse Razan al-Najjar is enough for the world to understand the extent of organized terror that our people (the Palestinians) are subjected to, and that the trio of international terrorism – Netanyahu, Trump and (U.S. Ambassador to the UN) Haley – belong in the International Criminal Court for the crimes they committed and the real threat they pose to the region and to world peace." Al-Najjar, 21, was killed during the violent riots along the Gaza border on Friday. The Palestinian Arabs are claiming she was shot by an Israeli sniper. The IDF has launched an investigation into her death. Barhoum’s comments come after the United States on Friday vetoed an anti-Israeli resolution in the UN Security Council. During the discussion, Haley attacked Council members for failing to condemn Hamas for firing rockets at Israeli communities in southern Israel.